A summer camp founded by the pro-Kremlin youth group Nashi will be held outside of Russia for the first time in 2013, in an effort to rally support from the Russian diaspora for projects back in their homeland, Izvestia reports. Sergei Belokonev, head of the Federal Agency for Youth Affairs (Rosmolodezh), said that the Selinger summer camp would be held in one European and one US location in addition to the original Russian one. He named Strasbourg, where the European Court of Human Rights is located, as a possible European site. There are an estimated 35 million Russians currently living abroad. The agency chief denied that the camp’s expansion was an attempt to bring young émigrés back to Russia. On the contrary, he insisted that it was necessary for Russians to “build up the country’s economic power” from abroad. “We need to attract our people to economic projects in Russian so that they become intermediaries, earn money working on these projects, get technology and investment into Russia and send products and services overseas,” Belokonev explained. The camps abroad, then, are needed for émigrés to develop projects to aid Russia, he said. Belokonev also stipulated that Rosmolodezh would not be organizing the overseas camps by themselves. Dmitri Sablin, a State Duma deputy involved in relations with the Russian diaspora, said that such camps can help the Russian government exercise leverage over foreign policy towards Russia. “If Russians living abroad are brought together in some sort of organized form, then European countries and the United States are undoubtedly going to think harder and choose more careful statements when making decisions that go against Russian interests. Then we won’t have things like the Magnitsky Act, which doesn’t do anything but satisfy someone’s ambitions. It has no meaning besides to foment hostility,” Sablin explained. Nadezhda Nelipa, executive director of Verrus, an organization that supports the Russian-speaking population in Europe, suspects that the camp is destined to fail if run by the Russian side. Political analyst Mikhail Vinogradov believes that Rosmolodezh is simply leeching off of the recent popularity in Russia of support for the Russian diaspora. He was also certain that Rosmolodezh’s strategy to stimulate entrepreneurialism among young Russians only has potential in Russia and will not be successful in the West. “Rosmolodezh has a choice right now between two strategies: it can continue stressing political, ideological projects or it can attract young people by supporting their business projects. The agency has recently been drifting towards the second direction,” Vinogradov said. 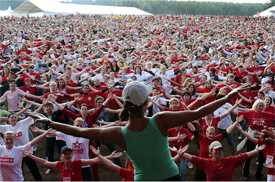 The youth camp Seliger was first held at a lake by the same name in Tverskaya region in 2005. Founded as a training camp for Nashi, it only allowed non-members to participate starting in 2009. The camp has been heavily criticized for indoctrinating young Russians with a paranoid Kremlin ideology and comparing human rights advocates to Nazis, as well as for leaving a great deal of garbage at the lake.